Sponsored by Asset Performance Networks, TINC exposes participants to emerging best practices that drive superior turnaround performance. It is governed by a strict code of conduct to ensure compliance with antitrust laws. TINC is the only conference where you will find detailed turnaround performance comparisons, derived from the industry’s premier turnaround benchmark database. TINC also features a unique combination of expert panels, breakout sessions, and industry experts sharing valuable ideas and experiences, as well as social activities. TINC is where you come to compare your performance to the pacesetters in industry and to gain insight into the hands-on methods that achieve competitive, predictable turnaround outcomes. Turnarounds are increasingly recognized as a business priority by companies. Established turnaround work processes are considered the norm, not the exception. Measurement, benchmarking, and readiness are increasingly used to track progress. The goalposts for what constitutes best practices have been pushed back (e.g. scope freeze date, execution plan and organization, timing of engineering work packages). AP-Networks actively searches for new practices that are driving better performance and TINC is a forum where these can be shared. TINC has a decade of history with sell-out attendance, and is now held annually in three different regions: TINC America, TINC Canada, TINC Europe. TINC was created by AP Networks, as an owners-only event that brings together turnaround professionals to share experiences, tools, and resources, and to enable learning across the industry. 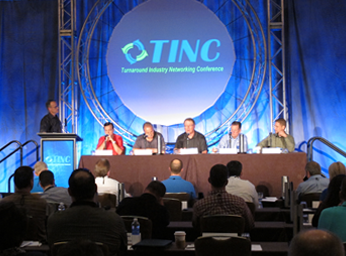 The first conference, TINC America, was held in 2003 in League City, Texas, with nine companies represented. Due to increased participation, TINC America moved from League City, Texas to downtown Houston, Texas in 2008. As the event grew, TINC Europe and TINC Canada conferences were added in 2011 and in 2013, respectively to meet global demand. In the last eleven years, over 1,000 turnaround professionals, representing more than 70 companies have attended TINC. Attendance is limited at each venue to ensure that the features that have allowed TINC to be the pre-eminent turnaround networking, sharing, and collaboration conference are maintained.